The musical life of St Mary's Church offers opportunities to all who wish to take an active part in this important aspect of worship. Experienced performers and those setting out for the first time, will find a warm welcome at any of our meetings. 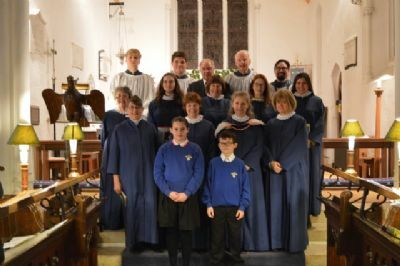 St Mary's Choir sings for the 9.30am Parish Communion service every Sunday (except the first Sunday of the month), for some evening services, for weddings and for other special occasions throughout the year. Adults and children from the age of seven years upwards are most welcome to visit or join at any time. Weekly practices are on Thursday evenings from 6.30pm until 7:30pm for the Junior Choir and 7pm to 8pm for the Adult Choir. Jubilate is a singing group for young people (Year 2 upwards). Members sing with the main choir at the Parish Communion at least once a term and are also the mainstay of the Family Service singing group. Minstrels is a resource group of instrumentalists – any age, any instrument, any standard. The group works on an ad hoc basis at present and playing alongside the singing groups or alone as suitable occasions arise.